The Worshipful Master, W.Bro. 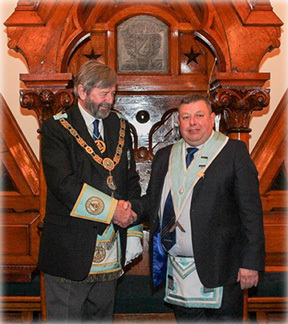 David Revels and secretary, W.Bro. Don Revels visited Brother Harry Paul to present him with his 60 & 70 year Certificates and Bars. Bro. Paul also celebrated his 96th birthday on the 2nd November. W.Bro. Harry Dennison of Lodge 23 being presented with his 60 year Jewel. L-R: Worshipful Master, W.Bro. David Revels, W.Bro. Harry Dennison and W.Bro. Stephen Revels, Lodge 23 Almoner. March 2016: Recent Charitable Donations. Click here. 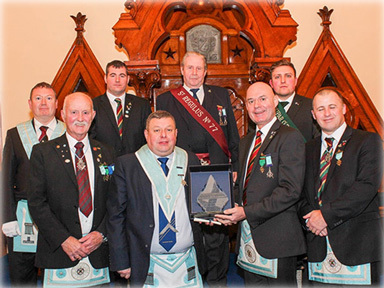 January 2016: The Installation Communication took place on Saturday 16th January. The Provincial Assistant Grand Master of Down, Right Worshipful Brother Harold Henning, and Right Worshipful Brother John Clarke, Provincial Asistant Grand Master of Armagh were were in attendance. 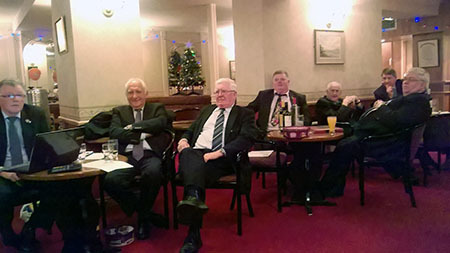 Approximately 65 brethren retired to the Festive Board. December 2015: At the Annual Lodge 23 bring and buy sale on the 21st December 2015, a well attended sale raised almost £1700. A great deal of thanks must go to all those who made a donation of goods or money, those who bought something at the auction, and to our two resident auctioneers, Ian and Jim. All money raised will allow us to help and support deserving charities. Thanks again to one and all. January 2015: The Installation Communication took place on Saturday 17th January. Provincial Deputy Grand Master of Down, Right Worshipful Brother John Clarke, and Right Worshipful Brother John Clarke, Provincial Asistant Grand Master of Downwere were in attendance.